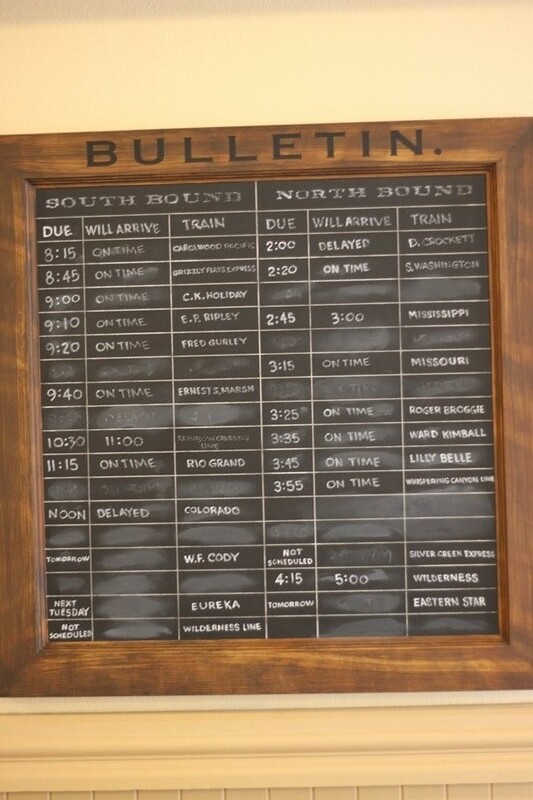 The Departures and Arrivals board in the Main Street station of the Walt Disney World Railroad is chock full of little details and nods that both amateur and astute Disney historians will recognize. The brightly lit board is a part of the Sorcerers of the Magic Kingdom and is seen by a multitude of guests every day. 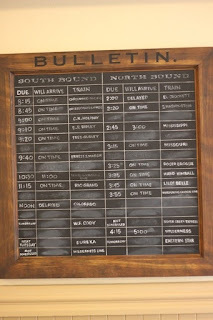 There is, however, a lesser seen bulletin board that sits off to the side of the Main Street station that includes a veritable who’s who list of trains divvied up between north and south bound trains. Often overlooked by guests as they take in the splendor of Main Street as it opens up onto Cinderella Castle, the board definitely deserves a few moments of observation and contains some magic of its own. Carolwood Pacific – Walt Disney own backyard locomotive. Grizzly Flats Express – Animator Ward Kimball’s backyard railroad, the first full-sized railroad to reside in someone’s backyard. C.K. Holiday – A locomotive of the Disneyland Railroad, with two ‘l’s in Holliday, named after the founder of the Santa Fe Railroad (then known as Atchison & Topeka Railroad, Cyrus Kurtz Holliday. E.P. Ripley – A second locomotive of the Disneyland Railroad, this time named for the first president of the Atchison, Topeka, & Santa Fe Railroad, Edward Payson Ripley. Fred Gurley – A third locomotive of the Disneyland Railroad, named for Fred Gurley, the president of the Santa Fe Railroad in the 1940s and 1950s. Ernest S. Marsh – Fourth locomotive of the Disneyland Railroad, added in 1959 and named for then president of the Santa Fe Railroad, Ernest S. Marsh. Rainbow Cavern Line – The Rainbow Cavern Mine Train was Disneyland’s first D-Ticket attraction. Rio Grand – The Rio Grande, with an ‘e,’ was the highest mainline railroad in the country. Colorado – The Carson and Colorado Railroad was a western bound railroad, a coach from which would go on to become part of Ward Kimball’s Grizzly Flats. Railroad. W.F. Cody – A locomotive of the Disneyland Paris Railroad, named for Col. William Frederick Cody, aka Buffalo Bill. Eureka – A locomotive of the Disneyland Paris Railroad, named for the yell miners in California would make when discovering gold. Wilderness Line – Named for the short-lived, but often dreamed about, Fort Wilderness Railroad. D. Crockett – Named after hero, senator, and legendary frontiersman, Davy Crockett. Portrayed in Disney history by Fess Parker, who also stated in The Great Locomotive Chase. S. Washington – This one still has my memory stumped. Mississippi – A locomotive of the Natchez & Hamburg Railroad. Missouri – The childhood home of Walt Disney, Marceline, is in Missouri. Roger Broggie – Roger is considered the first Imagineer and oversaw all things railroad for Walt Disney. The Walt Disney Railroad’s Roger E. Broggie is named for him. Ward Kimball – Mentioned above, Ward was an animator and railroad enthusiast the fed Walt Disney’s fascination with locomotives, he had his own backyard railroad known as Grizzly Flats Railroad. Lilly Belle – Recognition of Walt Disney’s wife, Lillian. Whispering Canyon Line – The fictional railroad line of the Wilderness Lodge. Silver Creek Express – Silver Creek is a waterway at the Wilderness Lodge. Wilderness – A second reference to the former railroad at Fort Wilderness. Eastern Star – The locomotive line at Disney’s Animal Kingdom that ran between Harambe and Rafiki’s Planet Watch under the name Wildlife Express Train.